1. Preheat the grill to high. Place the onion, beetroot and celery between some kitchen paper and press firmly to squeeze out as much juice as possible. 2. Put into a bowl with the minced beef and oregano. Season and combine the ingredients with your hands. Divide the mixture into 4 burgers. Place on a foil-lined grill rack and grill for 15 minutes, turning once until firm, brown and cooked through. 3. Combine the vinaigrette, parsley, capers and a little black pepper in a bowl. Remove the burgers and briefly grill the baps to heat through. Serve them topped with the lettuce and burgers. Drizzle over the dressing and add the reserved parsley and capers to serve. 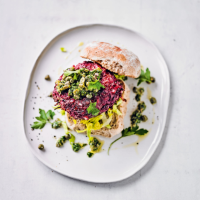 Cook’s tip For a ready-made and meat-free option, try using 2 x 210g packs Waitrose Aubergine & Feta Burgers and cook according to pack instructions.